If spending hours in an aerobics class or at the gym seems like a miserable way to lose weight, you can get back to nature and pedal your way to physical fitness by cycling around your community. There's no "right" number of miles to cycle. Instead, your weight loss depends on how frequently you cycle, your cycling intensity, your starting weight and your diet. Always consult your doctor before beginning this or any exercise regimen. 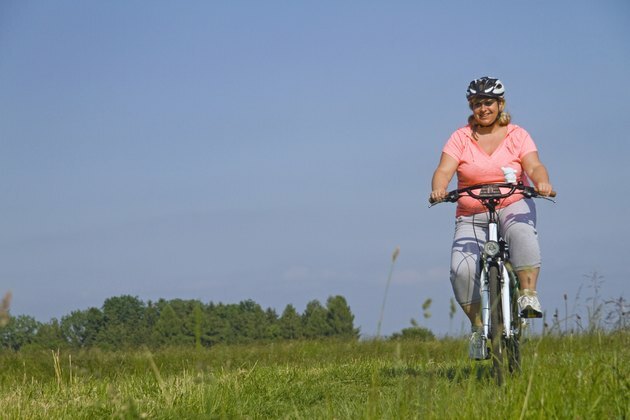 No single session of cycling will help you meet your weight-loss goals. Instead, it's cycling over time that matters. A pound of fat is equal to 3,500 calories, so if you're not dieting, you'll have to burn 3,500 calories a week to lose one pound. Combining cycling with other types of exercise and increasing your general activity level can help you achieve your goals. Heavier people require more energy to move their bodies, which means they generally burn more calories. According to Harvard Health Publications, a 125-pound person cycling at 12 to 13.9 miles per hour will burn about 240 calories every 30 minutes, while a 185-pound person will burn 355 calories. If you increase your speed to 14 to 15.9 miles per hour, you can burn 300 calories at 125 pounds and 444 calories if you weigh 185 pounds. If you cycle for half an hour five days per week, you can expect to burn 1,500 calories if you weigh 125 pounds and cycle at 15 miles per hour. If you can't cycle this quickly, you'll burn 1,200 calories a week cycling at 12 miles per hour. You might have to build steadily to this activity level, and cutting calories from your diet can help you spend less time cycling each week. If you feel dizzy or otherwise exhausted, decrease your activity level, and always talk to your doctor before you begin regularly cycling. Even an intense cycling routine might not be enough to enable you to lose a pound a week if it's all you're doing. Instead, you'll need to focus on cutting calories from your diet. Eating several smaller meals each day can help you feel fuller. Focus on healthy, filling foods such as nuts, fruits, vegetables and lean meats, and avoid high-calorie foods that have no nutritional value, such as sweetened drinks and sodas and sugary snacks. How Many Calories Are Burned Riding a Bike Seven Miles?